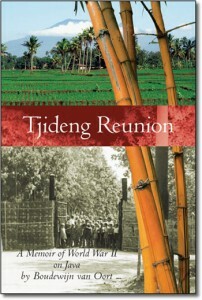 Bandung, or Bandoeng, the Art Deco city on Java, provides the setting for much of the story told in Tjideng Reunion (Chapters 3 to 8). This includes the last two years as a Europeanised colonial outpost on Java. It was a cosmopolitan city that prided itself on its vibrant social scene, and its growing architectural splendour, partly due to the fabulous wealth created by the tea and coffee plantation in the Preanger landscape that surrounded this city. By 1940 it ranked as one of the most important cities in terms of Art Deco buildings and boasted a brand new astronomical observatory located on the flanks of the dormant volcano that overlooks the Preanger valley. Bandung was on the international circuit of prominent musicians and cabaret artists, some of whom were caught in the city by the outbreak of the Pacific War. A measure of its international and multiracial demographic makeup can be gleaned from the Bandung address book published in 1941. Listed are not only the names and addresses but also occupations of the citizens. After March 1942 the Japanese Imperial Army strove to convert the city to an Asian community in accordance with one of its war aims. That conversion entailed the removal of a European presence by incarceration. The Japanese authorities never revealed the ultimate destination for these people. But the fact that Bandung was a racially diverse city with a large Eurasian (mixed race population) frustrated this policy. Therefore the Army imposed racial profiling, based on ancestry ( the number of grandparents who were “Asian”) to determine who was and who was not “European.” The rules were arbitrary and nonsensical. Ultimately your fate was determined by your appearance- the colour of your skin, your hair and your eyes. The ethnic cleansing brought about the whole sale relocation or incarceration of people with no regard for property nor kin, nor the impact on the economy, and it was the economic potential of Indonesia that had precipitated the Pacific war. During the earliest months of the occupation incarceration provided relief from violence and theft in the Bandung suburbs and outlying districts. The European population re-established a form of civil rule and gained a degree of security in these ghettos or camps, but the Eurasian community , which had been so important in the daily life of the city was mostly left at liberty but also denied employment and deeply traumatized, by severance of family ties with the European and the Indonesian members of the population. What had been a well-organized civic environment, providing ample support for commercial activity, sanitation , healthcare and justice , reverted to chaos, while those who had played the greatest role in its prewar administration were reduced to paupers. This remarkable change occurred while nominally “peace” had been re-established under Japanese civil and later, after 1943, military rule. The military operations of the Pacific War only touched Bandung very briefly, between February and March in 1942. No Allied attempt was made to wrest back control of this strategically important city until after Japan surrendered. 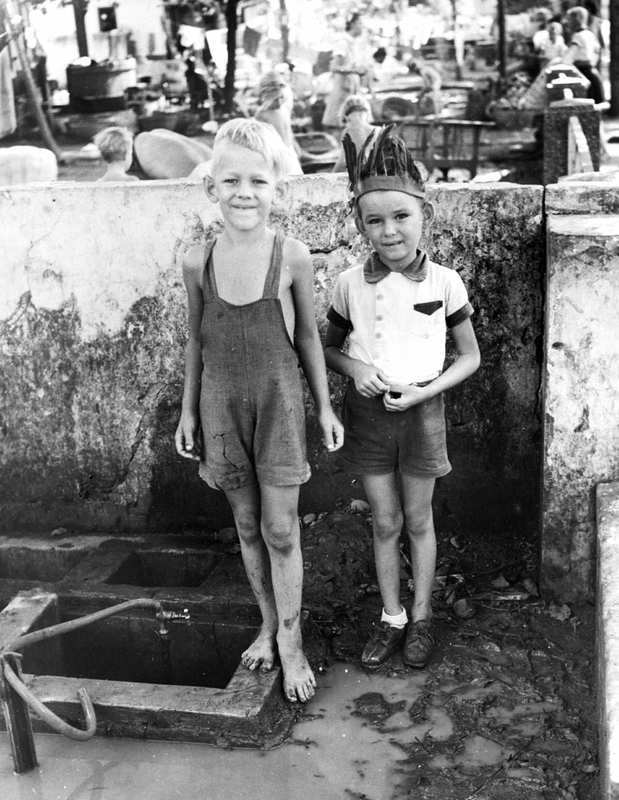 For three war-time years Bandung provided the setting for the largest women’s and children’s concentration camp in Eastern Asia. At its peak Tjihapit camp held almost 14,000 women and children. Bandung briefly captured world attention during this time. For a month in early 1942 it became the Headquarters of the Allied ABDA Command under General Wavell, charged with the mounting of a last ditch defense of the Malay Barrier. In April 1955 the city hosted the Bandung conference of non-aligned nations, an initiative of Sukarno, who then, as President of newly independent Indonesia, tried to carve out for himself a leadership role in Africa and Asia in the wake of European imperial disengagement. This historic event is to this day celebrated with non-stop news reel replays in the grand prewar hotels of the city. The vestiges of its former colonial history may be forgotten by the world, but today they remain clearly evident to an observant visitor, as well as being a point of pride for the inhabitants of Bandung. Bandung existed on eighteenth century maps as an insignificant village on the fertile Preanger plateau, the bottom of a pre-historic lake. The VOC (the Netherlands East India company ) recognized the area as a valuable source of coffee. When, during the Napoleonic interlude, the Netherlands State took over from the bankrupt company responsibility for these lands it appointed Herman William Daendels (1762- as Governor General. He took up his appointment in 1807, but it took him a year to arrive on Java because of ongoing hostilities between Britain and France. Daendels had spent some time in France (1787-1795), and introduced French centralized administrative ideas during his three year appointment. He also initiated the construction of the 1000 km long Great Postal Road from Batavia to Surabaya. That road passed near enough to the existing Bandung, to warrant relocation of this settlement to an area less prone to flooding. The name stuck. During the British intermezzo (1811-1815) not much changed in Bandung, but after restoration of Dutch rule, and especially later in the nineteenth century with the introduction of tea plantations, Bandung , with its more agreeable climate became a popular destination for European settlers. By 1940 when we arrived much of the city, particularly to the north of the Great Postal Road resembled a typical Dutch city with its parks and squares but located in the tropics. The southern, larger half remained Asian. A building boom moreover had provided the city with an impressive array of Art Deco buildings that to this day dominate the downtown area. Bandung in 1940 was probably the most Europeanised city in south east Asia with all the trappings of a typical Dutch urban landscape. Its population was very cosmopolitan, as can be inferred from the Bandung address book that came out just prior to the outbreak of the Pacific war. It was nevertheless a stratified colonial society described in chapter 3 of Tjideng Reunion. The transformation that this city underwent after the arrival of the Japanese army of occupation was dramatic as described in Chapters 4 and 5. The ethnic cleansing that took place changed the social image of the city almost overnight from one where European norms and physical presence largely predominated into an odd Asian city. The Europeans inside the concentration camps were completely cut off from the outside world as though caught in a time capsule, unaware of the changes that affected the rest of the city and the country. The remainder of the population, though ostensibly at liberty, found that the term term “Asian” now meant “traditional Japanese”. Both populations suffered grievously. The book, Tjideng Reunion, dwells largely on life within the camps ( Chapters 6 and 7), but for a glimpse of life elsewhere in Bandung during the Japanese occupation, the diary by Jan Bouwer is exceptionally informative. Tjimahi ( today spelled Cimahi) was a garrison town located ten km to the west of Bandung along the Great Postal road. During the Japanese occupation European civilian men, including my father, were confined there in former Netherlands East Indies army barracks. Although this was a huge concentration camp very little has been published about its existence. Most noteworthy is the collection of cartoons drawn by Donald Hartley and published in 1947 in Amsterdam. One Response to "Bandung, Paris of Java"